Alter Bridge's Mark Tremonti has gone and won the Riff Lord award, sponsored by Century Media. The Alter Bridge and Creed fret-flailer has got his hands on the coveted Century Media Riff Lord award at the Orange Amplification Presents The Metal Hammer Golden Gods In Association With World Of Tanks. He was presented the award by his bandmate Myles Kennedy. This was a non-voted category. Last year’s winner was Thin Lizzy’s Scott Gorham. 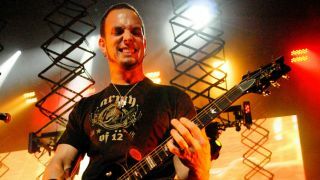 TeamRock managed to catch up with Mark Tremonti after he picked up his Riff Lord Award at the Metal Hammer Golden Gods – we find out who inspired him to pick up the guitar in the first place and much more. Do you agree with Mark Tremonti winning? Who would you have voted for?